Sadly, Blue’s Pub is no more. For a similar at-home feel in a Frisco bar try Stan’s Main Street.Why is it that all neighborhood bars somehow get compared to “Cheers?” And yet, that feeling of being home-away-from-home in a local tavern is a hankering we all get from time to time.So if you’re anywhere near Eldorado and Tollway in Frisco, stop in at Blue’s Pub. You’ll quickly become one of the gang and find out why this is one of Frisco’s best neighborhood pubs.As soon as you hit the door, you’ll be greeted by a casual cozy atmosphere, hardwood bar that you’ll want to just belly up to, and quite possibly by Blue himself. Former owner of the Irish Rover, Blue knows how to deliver a great neighborhood bar atmosphere appropriate for casual dates and friendly gatherings with beer-drinkin’ buddies that is also a family friendly environment for those Saturday afternoon post-soccer game” celebrations with the kids. Boutique. Salon. Studio. Incorporating all things “style” from your hair to your hemline, the Style House provides salon services, photography, and even a women’s boutique for jewelry and designer apparel. 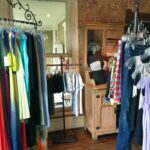 If you’re looking for a place to relax and be pampered, The Style House is a little slice of heaven in Frisco. Featuring industry professionals in haircuts, color, deep conditioning, blowouts, hair extensions, massage therapy, waxing, skin care, nail care, makeup services, and eyelash extensions. From their vintage chic decor to the cozy fireplaces throughout, prepare to be pampered, polished, and peaceful upon your departure. Everyone in the Style House dedicates themselves to enhancing your hair, beauty, and overall self-confidence. Because every individual is unique, they customize each service and select products that meet your particular needs. Additionally, their business separates itself from the average boutique by combining a salon with a clothing, fragrance, and candle boutique by selling professional hair products (such as Kevin Murphy and L’Oreal Professional), skin care products (such as Farmhouse Fresh and Sharla’s), soaps and home fragrances from Nest, plus fashion items. The Frisco Events Weekend Round up includes an American & British classic, good jazz, and lots of opportunity to try wine all served up with some extra sauce! Come out for the weekly wine free tasting at the Wine Cellar at Starwood. Break out your acid washed jeans, Hysteria – A Def Leppard Tribute, is playing at The Pub in Frisco. Do you sculpt? Are you a technical artist working in 3D? Frisco Arts is looking for spectacular sculptures for several exhibitions in September at the Frisco Discovery Center. Be sure to stop by the Frisco Farmers Market from 8am to 1pm or until supplies run out (and they usually do). The FC Dallas are home this weekend vs Stoke City. Get Tickets! The Frisco Noon Lions Club Project presents the 1st Annual Sauce Fest! Join the taste testing! Purchase tickets for veggie, chicken, or beef tasters plates! Random prizes will be awarded. From 9-11:30am, in the Farmer’s Market area. Sunday & Wednesday: Cinemark Classic Series is showing “American Graffiti” at the Cinemark in Frisco Square at 2pm Sunday and 2 & 7pm Wednesday. This is the movie that kickstarted George Lucas’ career (yeah, it did a little better than THX 1138) and you’ll see a lot of familiar faces from his earlier films. There is a reason ancient Greeks took to saying “in vino veritas” (in wine there is truth). So, I won’t even try to lie. We’re big fans of fermented grapes! You can buy wine at a lot of places around Frisco and many of them offer a great selection. But, two things I always look for when I’m wine shopping is a knowledgeable staff, an unpretentious sommelier, and a chance to taste! Fortunately for Frisco, the Wine Cellar at Starwood has them all. The Wine Cellar carries an array of wines, so it’s become a favorite place to go to find something new. It’s good to have regular stand-by’s on hand, but sometimes it’s also nice to find something different or unique. If you’re into exploring wine, not just drinking it, then the Wine Cellar is a must. There isn’t much to say about prices, since wine tends to be all over the map, and every wallet has a different tolerance and everyone a different taste. If your taste runs a little more upscale, you’ll find wines to suit you as will those looking to spend a little less. I almost always get out of the Wine Cellar spending less than expected, and I have found some fantastic bottles of wine for around $20 or less which leaves me feeling like I just discovered a well-kept secret. But as an Amarone fan, I’ve also spent much more. One of the highlights of the Wine Cellar is their free weekly wine tastings. If you’ve followed Lifestyle Frisco for any amount of time, you will have noticed that we promote them every week, and for good reason. They advertise the wines they’ll be tasting each week in their newsletter (sign up in the store), so you can see if there is anything that interests you. It’s also a great way to try four different wines side-by-side before deciding what to buy. The first wine tasting we went to was on June 27th where we discovered the 2009 Hannah Nicole Zinfandel. It was one of four excellent wines, but by the time we had tasted them all it was the one that best suited my wife and I. The shop is relatively small but has a nice open layout and a tasting room in the back that is also ideal for small events or gatherings. The staff has is friendly, knowledgeable, and always there to help. So if you have questions, just ask. They won’t make you feel like a wine noob. The next time you’re in the market for a bottle of wine, stop by Wine Cellar at Starwood, and tell Owner/Sommelier David we said hello… and that we’ll see him soon! Morning. Noon. Night. That’s about how often you’ll want to drop and get your Three Squares. 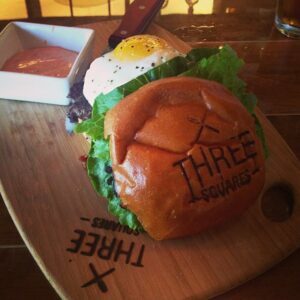 With a front door directly across from the Cinemark HD on Frisco Square, the Three Squares menu has options for different tastes no matter the time of day. Want to get your brunch on? Try one of five different tacos, a yogurt-granola parfait, Belgian waffles, or S’mores French toast. When we went in on Sunday morning, I ordered the Sweet Bacon Taco which melted in my mouth… the combination of bacon, tender almost melting sweet potato over a scrambled egg wrapped in a corn tortilla was perfection. Starters and salads include chips and salsa, cannelini bean hummus, Cajun deviled eggs, bruschetta, fried pickles, Caesar with blackened salmon, Chinese chicken, and a “farmers” salad with roasted vegetables. Six burgers range from a $7 plain burger to a $12 steak burger. Entrees such as potato-crusted mahi mahi (Chef Stan’s favorite entree) and pork belly with egg are epicuriously complex but easy on the wallet. A large assortment of sides includes potato tots, jalapeño grits, and of course, Stan’s Cheddar Mac & Cheez-Its. All entrees are served on mini wooden “plates” which feel more like personal cutting boards and branded with the Three Squares brand. For dessert, there are a variety of milk shakes including exotic flavors like peanut butter and praline, but you absolutely have to try the Whiskey Bread Pudding… words can’t describe it. Insider tip: You don’t have to park on the street. There is an indoor hallway that leads from the parking garage to the Three Squares entrance (it’s not just for the hospital). You’ll have to briefly step out side between the hall exit and Three Squares front door but you’ll always be covered from rain or the Texas sun. The other tip we’ll give you is to look all over the menu when deciding what to eat. There are food items for all meals all over so give it a good look and don’t miss anything. Three Squares also has a covered patio that looks out onto Frisco Square, and the best part is that after about 12 noon, you’ll be shaded. On each visit we’ve found the staff to be friendly and helpful. Open 7 Days a week: 8am till late! The Frisco Events Weekend Round up includes wine, art, live music, classic movies and as always, a good dose of sports including a youth sports wellness expo. Enjoy your weekend! Time for wine! Come out for the weekly wine free tasting at the Wine Cellar at Starwood. The ever popular Music Ninja’s are at the Lemon Bar or you can dance with Emerald City at The Pub In Frisco. Sean Michael Anderson, better known by his stage name Big Sean, is in Frisco with special guest Roscoe Dash. He’s got friends in high places, so you never know who else might show up!!! 8-10pm in Dr Pepper Arena, 2601 Avenue of the Stars. Sunday & Wednesday: Get your pledge pin at the Cinemark Classic Series is showing “Animal House!” at the Cinemark in Frisco Square at 2pm Sunday and 2 & 7pm Wednesday. The Frisco RoughRiders take on the Midland Rockhounds Monday – Wednesday all games starting at 7:05pm.